Keyhole Limpet Hemocyanin (KLH) is a vitally important protein molecule with an extensive history of use (50+ years) in therapeutic vaccine development and immunological research. It is widely used both as an active pharmaceutical ingredient (API) in certain immunotherapies and as a finished product for testing immune status in patients and research settings. As an API, KLH is an effective carrier molecule in immunotherapies being developed for the treatment of various cancers and for other serious diseases such as Alzheimer's, lupus, dermatomyositis, and diabetes. KLH is also extensively used by pharmaceutical companies and researchers as a safe immune-stimulating antigen in drug immunotoxicology studies and for assessment of immune status. For example, KLH is a standard immunogen in T-cell Dependent Antibody Response (TDAR), a functional assay often used to monitor the effects of new drugs on the immune system. 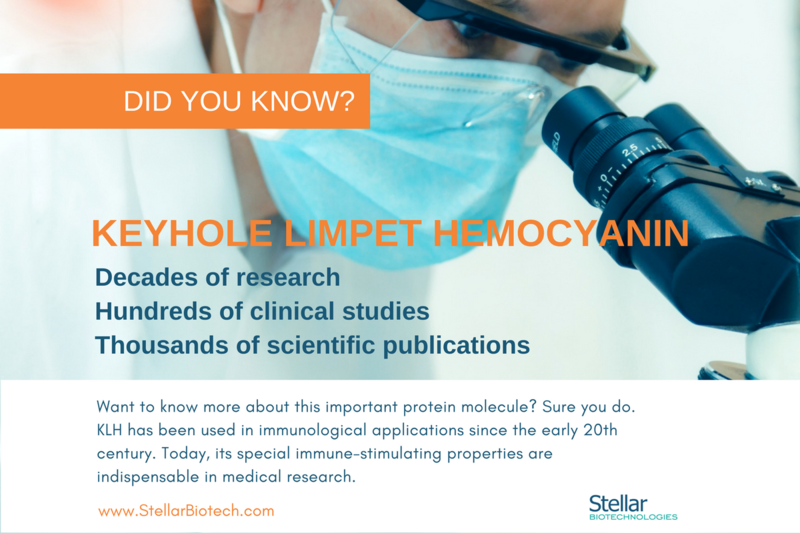 Discover more about KLH at the Keyhole Limpet Hemocyanin Knowledge Base. Additional resources for scientific and clinical research involving KLH include the U.S. National Library of Medicine and the U.S. National Institutes of Health clinical trial database www.clinicaltrials.gov. Stellar Biotechnologies is the leader in sustainable manufacture of KLH protein. We are focused in the rapidly evolving field of immunotherapy development.